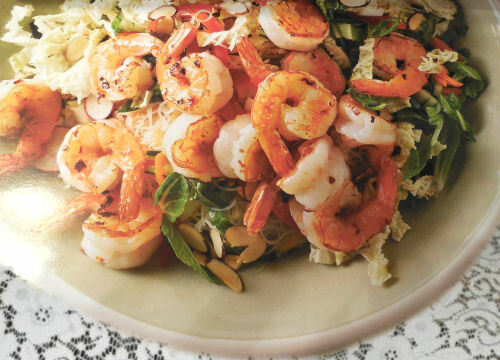 This recipe for spicy shrimp uses a salad slaw base that is full of nutritious and healthy veggies. Just the perfect dish for a hot summer night. Be sure to arrange the star ingredients, in this case, the luscious shrimp so the eye focuses on them when you look at the dish. The arrangement is half the recipe, I think. This recipe has been adapted from one I found in an old Pot luck cookbook. I’d love to see one of my friends bring this to a pot luck dinner. How about you? Add a bit of heat to your shrimp with this easy and tasty recipe. The cabbage soil has a nice cooling effect. 1/4 tsp cracked black pepper. Combine all of the dressing ingredients in a small bowl and whisk until combined. Set aside. Rinse the shrimp and pat dry. De-vein them. In a large skillet heat the olive oil over medium heat and cook the garlic and crushed red pepper for about 30 seconds. Add the shrimp and cook for 30-4 minutes until they turn pink. Do not over cook or they will be tough. Remove from the heat and set aside. Cook the noodles slightly in light boiling salted water for 3 minutes. Drain. Cut into smaller pieces. In a large bowl combine the vegetables, cilantro and drained rice noodles. Pour the lime ginger dressing over the veggies. Transfer to a serving platter and arrange the cooked shrimp over the top.